Puppy reservations are available for this litter. Preference given to performance, obedience, agility, hunt test and pet hunting homes. This litter will be raised at the home of Jeanie & Mike Swanson in Rice Lake, WI. Both Max and Addie have OFA Good Hip Clearances, both have OFA Normal Elbow Clearances, Current OFA Eye Exams within 12 months of the breeding, OFA Normal Heart clearance by a Board Certified Cardiologist, full dentition (scissors bite), normal thyroid function, not on any medications, no skin allergies, seizures or other auto-immune disorders. Genetic Tests; Both Max & Addie are NCL-5 Clear, ICT Clear, PRA-Prcd Clear, PRA-1 Clear, PRA-2 Clear, DM Clear. We are excited to announce this planned breeding and thank Angela Chamberlain & Susan Roberts for the opportunity to breed Addie to Max. He is a young talented boy and the journey has just begun. Our goal for this breeding is to produce intelligent, athletic, sound retrievers with lots of drive, speed, focus and strong work ethic. Paired together these should be really fun pups for homes to participate in performance venues (obedience, rally, agility, tracking), hunt tests or hunting. 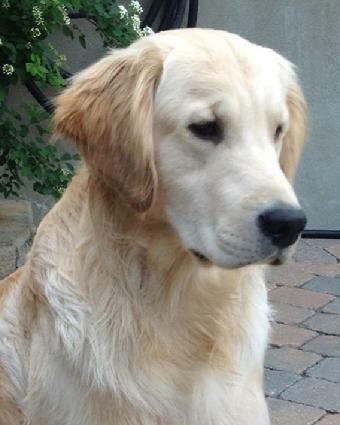 Both Max and Addie have sweet, fun loving personalities, solid Golden temperaments and a good off switch in the house. The puppy pedigree has a low inbreeding coefficient and is a wonderful blend of outstanding performance, field and show Goldens that have excelled in many venues. 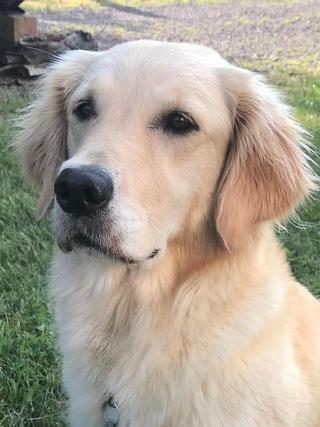 Max is a young, fun-loving dog, who typifies the wonderful traits of Goldens - friendly, smart, biddable, confident and with a great on-off switch. He is the easiest dog to live with, being laid-back and calm at home or on outings, never needy or demanding, but always ready and eager for anything. Max’s biggest strength is that he is a real team player, and lives to please me. Although I am a novice handler in field and obedience, Max is doing well. He particularly loves obedience and is very enthusiastic and attentive. Although serious when required, Max still has a goofy, playful side. We just entered our first obedience trial and Max earned his CD with some very nice scores and a High in Class. In the field, Max is a natural retriever and loves the water. At 9 weeks old, he would jump into a pond to retrieve ducks as nearly big as he was and then drag them up the shoreline to me. He has a great water-entry, which is fun to watch in the field, but has necessitated fencing off our swimming pool, otherwise we’d have Max flying in on top of us. He is very honest, not inclined to cheat, and will swim or drive through anything. This summer, at just over 2 years old, Max and I earned my first JH, WCX, and SH titles. Max is a moderately-sized male. He is 23 inches tall and weighs 70 lbs. He has black pigmentation and brown eyes. His coat is easy-to-maintain, never matts, and drip-dries quickly. Despite swimming daily from May to November, Max has never had a hotspot. He is short-coupled and has good front and rear-angulation. Max is co-owned by our good friend and mentor, Susan Roberts. At two years old, Max and I are having lots of fun and we can’t wait to see what the future has in store for us! When Addie arrived from Canada we were instantly in love with her sweet temperament and engaging personality. Addie loves people and has the ability to make everyone feel like she loves them the best. She will be tested for her therapy dog certification in February. Addie is 55 lbs. and stands 21 ½ inches tall. She has good bone and nice dark pigment that gives her a very pleasing, soft, expression. She has a beautiful coat that dries incredibly fast and it does not burr up when hunting. She has never had a hot spot or skin condition. Field dogs need good structure to withstand the rigors of hunting, and Addie has been awarded the highly regarded CCA title that embodies the principles of our breed standard. We are mainly upland hunters, hunting grouse and pheasant. Addie loves to hunt and will go tirelessly in the field all day. She knocks down crippled birds with gusto. There have been many times when we would have given up on a bird, but then all of a sudden Addie shows up with it. Addie loves to swim. Her favorite thing is retrieving bumpers off the dock (or anything else she can jump off of). Last summer we took a boat ride to the sand bar. While we were throwing bumpers for her she would deliver them to us on shore and then jump in the boat so she could launch herself out after the next one. Addie is very biddable in obedience and is an exceptional team player. She tries very hard to be right and flourishes with positive methods and attrition. At obedience classes it is common to hear “what a fun little girl”. She is a natural heeler, with great focus. Addie flew through her foundation agility classes. She took to each piece of equipment with natural confidence and is only held up by the limitations of her rookie handler. Addie gets along well with other dogs. She lives with our 12 year old golden “Bella”. There has never been a squabble between them. Addie has a great off switch in the house, she is calm and quiet in her crate while waiting her turn, but is always willing and ready to play any game. She really is a fun little girl! Contact Jeanie Swanson mikejeanswan@gmail.com if you are interested in a puppy from this litter.